The National Education Association (NEA) in conjunction with the First Lady, Michelle Obama, officially kicked off National Read Across America month on March 2nd, the beloved Dr. Seuss' birthday. Read Across America is a reading motivation and awareness program designed to get each child involved in and to celebrate reading. March 2nd is celebrated all over the nation by teachers, politicians, parents, grandparents, atheletes, and librarians. Many schools extend the celebration by encouraging children to read all month long. Shortly after I received my Bachelor of Arts in English, I volunteered at my local library as a literacy tutor. It was truly an eye opening experience for me. It would never cease to amaze me when 50 and 60 year old men and women walked into the library wanting to learn to read. I was flabbergasted. Just imagine spending your entire life of 50 years without knowing how to read. It was a whole new world for them once they mastered some basic reading skills. Since those days, I have been a champion of reading. From the time my girls were babies, I have instilled in them an absolute love of reading and books. I encourage you to invest some precious moments this month encouraging your children to pick up a book and get reading. 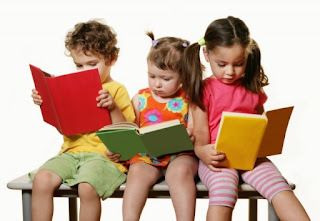 If your children are too young to read, open a book and read to them. Babies may not be able to tell you so, but I can guarantee that they love when we read to them. For more information on the NEA's Read Across America initiative, click here.